Sul always straight to the point with the hardball questions. Anyway, this chapter finally establish that Jung is a handsome man. Amongst all his faults and mystery shrouds, one thing is clear: he's not bad to look at up close. Oh, so fast! :D Thank your for a new chapter already! 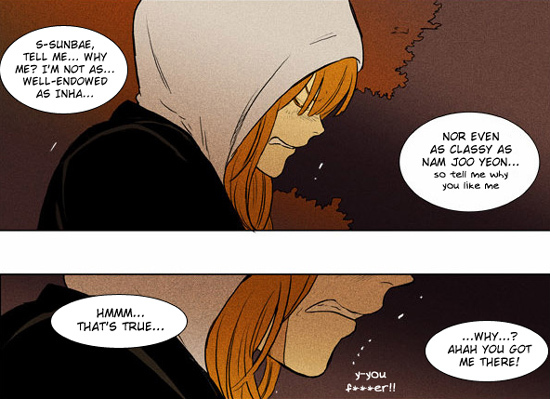 What's funny is that I never found any guy attractive in this story just due to the art style... so Jung's OVERWHELMING GOOD LOOKS + LOL TWISTED angle never got me. He was just like, a kind of weird looking guy + LOL TWISTED. (Though the art improved, but srsly lolol @ the early shots of In Ho e.g. in the restaurant supposedly ~so hawt~ and I was just like lol wut Even Sul's reaction to Jung when she first saw him I was like :|???? When will next chapter releases? Naver Translate doesn't work for me nor my friend atm, and it's not because of the browser or anything like that. It only translates the beginning of the page, but not the actual comic. Refreshing the page doesn't work either, I got up to chapter 7 season 3 and then it just stopped working. Could someone fix it soon please? Don't know where I should report this so I'll just leave this here. Loved your translations so far! Can't wait for the next release! I can't access naver's chapters past the official english translation. What happened? Any other magic trick to make it work?